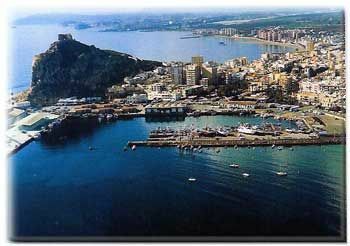 Aguilas is a seaside resort located in the heart of the Costa Calida, in the Murcia Region, south of Spain. Aguilas has got a fully maritime tradition combined with a wide touristic offer with its extensive coastline as one of the main attractions. Aguilas town offers a beautiful 34 kilometres of coastline which makes it a major tourist destination of the Murcia Region. The coastline has coves and lonely beaches with crystal clear water, such as La Higuerica, La Carolina or Calabardina, city beaches such as Las Delicias and one of the best areas of the Mediterranean coast for diving thanks to rocky bottoms, especially in the island of Fraile and in the fortress of Cabo Cope area. The nearest airports to Aguilas are Almeria airport, located 120 kilometres south of the town, Alicante airport, 175 kilometres north and Murcia San Javier airport, 105 kilometres from the touristic town of Aguilas. Airport transfers with professional drivers are offered by many online booking agents, prices for a private taxi from Murcia airport up to 4 people and 4 luggage start from 111.00 €. Aguilas is a touristic resort located in the Costa Calida area, Murcia Region, Spain. Aguilas is known for its carnivals declared an appointment of International Interest in the year 2015. Private sedan car for 4 people and 4 luggage with professional driver, Meet&Greet included, Journey time 120 minutes. Private sedan car for 3 people and 3 luggage with professional driver, Meet&Greet included, Journey time 75 minutes. "The beautiful square is one of the many places in Aguilas where you can sit and watch the world go by. You can choose to find a shaded bench or sit at one of the numerous cafes and bar that are situated on its perimeter. Difficult to drag yourself away!" "Plaza de Espana is very picturesque with the old town hall the centre piece. There are plenty of cafes to have a drink or eat and to take in the atmosphere." "Aguilas has a great central area to sit and chill out before during or after meals. There are many restaurants , ice cream parlours and bars. Our Favourite was Chupitos... The staff there were friendly and we kept going back for drinks and the odd tostadas. The centre piece of a fountain and trees breaks up the square..."